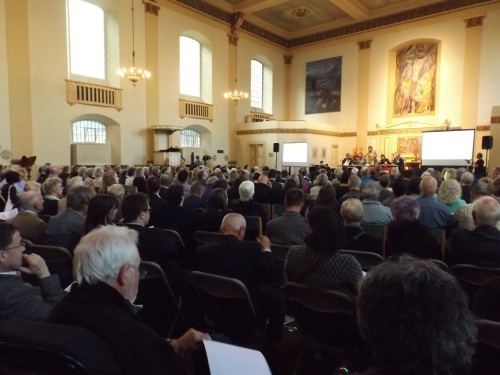 “The Ramblers of London oppose the Garden Bridge.” said Inner London Ramblers chair Phil Marson speaking at St John’s Waterloo on Monday. He was addressing a packed meeting called to rally opposition to the proposed Garden Bridge and press new London Mayor Sadiq Khan to cancel it. Earlier architect Ian Ritchie had described the Garden Bridge as “celebrity hype and hubris”. He also suggested that the design would result in a crossing which was too big and unbalanced. His summing up was “a dangerous folly”. The opposition appears to centre most on loss of a world famous view from Waterloo Bridge, loss of the view from the Thames Path just downstream of the NFT and the felling of mature trees on a much loved stretch of the national trail. Trees on the bridge will, apparently, be of a different nature and not so tall. The meeting was chaired by Kate Hoey MP who said the bridge was “not much of a garden, and not much of a bridge”. 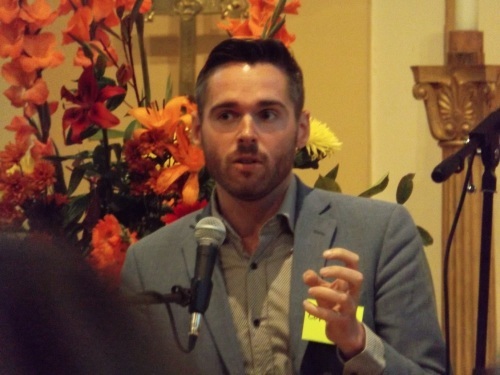 Speakers included Tom Copley who has been re-elected to the London Assembly.